E.P.A. Struggles to Regulate Natural Gas Industry – NYTimes.com. “It was shameful,” Weston Wilson, the E.P.A. whistleblower, said in a recent interview about the study. He explained that five of the seven members of that study’s peer review panel were current or former employees of the oil and gas industry. For example, the agency had planned to call last year for a moratorium on the gas-drilling technique known as hydrofracking in the New York City watershed, according to internal documents, but the advice was removed from the publicly released letter sent to New York. He was also there promoting his book which Mr. Morris claims is the plan to be taken for the Republicans to win in 2012 and in every state where these barely won elections have given them a place to push their agenda to specifically gut all the programs in place now. As I was reading some of the things about hydrofracking the other day, (which was an thoroughly extensive article, I’ll go get the link) and thinking that they’ve known these things the whole time, why wasn’t something created to fix this. And, then found this article today which explains a lot. A program that is forced to alter scientific and researched results cannot possibly define what the problems are that must be addressed and “fixed”. When the EPA and other scientists were not allowed to report their findings compelling action based on the science and the actual facts of the situation, it left problems unaddressed, unsolved and unfunded for the solutions to be developed. At any time, our universities could have researched solutions for these waste products from hydrofracking, it could very easily be solved with an addition of a system, process or neutralizing effort to reclaim those contaminants from the water. Our business leaders could have encouraged the finding of those solutions to be added to what is being used by the natural gas drillers that are using hydrofracking processes. Right now, each one spends something around $2 million dollars a year to have the waste water dumped into the rivers or water treatment systems which are not capable of handling it. For $2 million dollars, surely there are systems which could be defined, created and added which would reclaim the radioactive and other toxic chemical products from the water before adding it to the existing water systems and rivers. In fact, it probably wouldn’t cost $2 million dollars and it would provide excess revenue streams to collect and sell these other “elements” to industries who are desperate to have them. It isn’t good thinking, nor good business to create the problems, pretend the problems don’t exist, pressure Congress and the EPA to hinder the facts about these problems being reported or studied and defined, nor to ignore these problems in need of solutions. It says that the intentions of the Republican Party members now planning to further their previous agendas with the same heavy hand as always with an insistence on “No Compromise” – will end with no loss for profit-makers, no requirements for change to how profit-makers are doing things now and no regulations to force them to take into account the science and safety and pollution of what they are doing in order to do it a different way or add solutions to accommodate fixing those problems (issues). That has already been a costly way to do things. And, what I don’t think the Republicans understand whose power plays are now creating chaos, distraction and waste of Congressional and state resources in time and decision-making, is that we are all on the same team. We all want natural gas prices and production costs to be kept low to have it available to us at the most reasonable price possible. But, we don’t want to pollute the bed where we all most sleep and thoroughly contaminate the only water we have to drink. The Republicans have cut the super fund cleanup funding for many, many years. And, they forced certain research, studies and science about these chemicals involved in the need for superfund cleanup to be “edited” in their content. The only thing that has done is to leave the problems to us now, including the health disasters that have been created. There is no escape from it. If the rules of this war the Republicans have declared on America are “no compromise” as we have seen for the last two years with their complete “no” to everything that needed to be done for regulating the financial system gamers, for food safety inspections, for consumer safety commission working for the safety of American citizens rather than for the industries they are supposed to watchdog, etc., etc., etc., – then “no compromise” for our safety needs to be what America’s citizens and communities demand too. No more compromise on wastes being sent into our water systems that have any harmful, toxic chemicals in them. The industries who are doing that can simply stop doing it right now. No compromise. Mayor Bloomberg is very staunch about non-smoking in his city because of his concerns about the cancer it can cause. He was on the show about the Tobacco Wars on cnbc broadcast yesterday, describing how important to stop this because of cancer. So, why is there a petroleum cesspool in Brooklyn that hasn’t been cleaned up for over fifty years? He’s so concerned. Everyone that has lived in those areas that have been exposed to it have either died of cancer or get cancer or watch their children die from cancer – there are birth defects that are known to be higher in that area, cancers higher in that area and he is worried about the people smoking? It doesn’t make any sense. And, there are places in the New York City area which will be affected by the hydrofracking wastes that are going into the water table, going into the rivers untreated to take out the radioactive and chemical wastes that are dumped by hundreds of millions of gallons into it, and sure to make its way into the drinking water available to every single member of Mayor Bloomberg’s New York City. Surely he would find that an abomination. Any Republican that would sit in Washington and decide to fight against the EPA having power to do something about it also wouldn’t want their own children to drink that water downstream from these dumping sites and then watch the results over the course of their lives. They certainly wouldn’t want to drink that water everyday, cook with it, wash their collards with it, wash themselves in it and feed it to those they love. See, this could be fixed. It just needs to be shown for what it is, the problems defined, funded and fixed. The business owners need to be reasonable and seek solutions that work better and more cheaply than what they are doing already which is known to be polluting (and is expensive, as well.) Funding for solutions can be offered when the problems are defined by the science unfettered, unedited and unhindered. The goals are the same. We all want a better, safer place to live to raise our families and we want cheap natural gas as a fuel and heating source. Can’t we do both? Aren’t we smart enough to do both? Last September, Senator James M. Inhofe, also a Republican from Oklahoma, wrote to agency officials to offer his guidance about who should be allowed to review the research. “We caution against potential panelists who have been longtime critics of hydraulic fracturing,” he wrote in a letter. Over their careers, the two lawmakers from Oklahoma, a major drilling state, have been among the Senate’s top 20 recipients of oil and gas campaign contributions, according to federal data. These topics were cut from the current study plan, even though E.P.A. officials have acknowledged that sewage treatment plants are not able to treat drilling waste fully before it is discharged into rivers, sometimes just miles upstream from drinking water intake plants. While the current study plan clearly indicates that the agency plans to research various types of radioactivity concerns related to natural gas drilling, this river modeling, which E.P.A. scientists say is important, has been removed. The risks are particularly severe in Pennsylvania, which has seen a sharp increase in drilling, with roughly 71,000 active gas wells, up from about 36,000 in 2000. The level of radioactivity in the wastewater has sometimes been hundreds or even thousands of times the maximum allowed by the federal standard for drinking water. The Times also found never-reported studies by the E.P.A. and a confidential study by the drilling industry that all concluded that radioactivity in drilling waste cannot be fully diluted in rivers and other waterways.But the relatively new drilling method — known as high-volume horizontal hydraulic fracturing, or hydrofracking — carries significant environmental risks. It involves injecting huge amounts of water, mixed with sand and chemicals, at high pressures to break up rock formations and release the gas. I really want anyone interested in this and in their quality of life to go read this entire article above and the one from the New York Times at the beginning of this post. Do not take these few excerpts by my interest in it as the only important parts of these articles. They are well written, well- researched and hold a lot of critical information that the public (everyone in the public) needs to know. I’m using these for a specific line of thought that I have right now, which is that the creation of solutions to treat this wastewater need to be developed right now which will reclaim the toxic and radioactive elements from it before being sent into our water systems. It looks like a pressing need, the politics involved with what our Republican leaders backed by the oil and gas industry are trying not to get done with it make this very dangerous to the public throughout the country, and I think it can be fixed because I want to believe that. I don’t want my family dealing with the results of doing nothing but what they are doing already. Enough is enough. In a drive to improve worker safety and consumer protection, the EU’s chemicals watchdog is set to publish in the coming months an inventory of over 20,000 chemicals declared hazardous by manufacturers and importers. The inventory “will significantly improve safety by providing up-to-date information on all the hazardous substances that are on the EU market today,” said Geert Dancet, executive director of the European Chemicals Agency (ECHA). An EU regulation on the classification, labelling and packaging of chemical substances and mixtures (CLP) requires companies to classify, label and package appropriately hazardous chemicals before placing them on the market. It aims to protect workers, consumers and the environment by means of labelling which reflects the potential hazardous effects of dangerous substances. The regulation will implement at EU level the United Nations’ Globally Harmonised System (GHS) for classification and labelling of chemical substances and mixtures. “These substances are in wide dispersive use, which means that not only are they used everywhere, but there is also a risk of exposure to humans and the environment,” the head of ECHA’s risk management unit Remi Lefevre told AFP. The agency is calling for the chemicals, which are either cancer-causing or harmful to reproduction, to be used only with express permission from the European Commission. All but one of the chemicals are used in large volumes in Europe, including chemicals found in various pigments and plasticisers, and one substance used in explosives. Six substances of very high concern will be banned within the next three to five years unless an authorisation has been granted to individual companies for their use. These substances are carcinogenic, toxic for reproduction or persist in the environment and accumulate in living organisms. Beneath the Brooklyn neighborhood of Greenpoint, New York, is a giant oil spill that BP, ExxonMobil and Chevron are slowly cleaning up. This spill is different though. The oil is trapped in the ground, sitting on top of the water table, across more than 50 acres of residential and industrial blocks. In some areas it’s 3 feet under; at other points it’s as much as 50 feet underground. And some of the oil has been sitting there for 150 years. But to neighborhood residents who complain of health effects, the cleanup is far too slow. “This is Patrick McManis and he had stomach cancer. And this is my mother. My mother had the cervix cancer,” said Theresa Breznak shuffling through rosary cards of family and friends on Diamond Street who have been stricken with cancer. The environmental mess goes back to the 1860s when oil refineries dotted the landscape along Newtown Creek (which the Environmental Protection Agency recently declared a Superfund site.) For a century, oil companies operated in the neighborhood, allowing petroleum to seep into the ground and spill into the water. “It’s emissions that are coming out of the ground. Some of them have been known to be benzene fumes, which is a known carcinogen,” complains Tommy Stagg, another life-long resident of Diamond Street.In all, the energy companies have extracted more than 11 million gallons of petroleum since the early ’80s. But, last year New York state estimated there was still about 14 million gallons of oil remaining below the ground here. The companies are extracting oil at a rate of about 900,000 gallons a year by injecting water into the ground at various sites around the neighborhood, then pumping out petroleum. At that rate, it’ll be well over a decade before the neighborhood is cleaned up. Okay, the New York City residents and leaders do understand that ground water doesn’t stay in the boroughs where they’ve made lines on a map between them, right? I mean – they understand that water, air, underground water, streams, water table resources and anything contaminating them – migrates wherever, right? I am adding the category “Democracy” to this post because when people cannot safely live where they live – there isn’t any democracy, liberty or freedom being insured to these American citizens. Whether it is the love canal mess, or the disaster in the making all this time in Brooklyn and now from these wastewater disposal disasters as by-products of hydrofracking, the sicknesses and ill health generally takes away all the freedoms, liberty, democracy and opportunities guaranteed to individual citizens of America, as well as destroying personal potentials to a great life or accomplishment or enjoyment or the pursuit of happiness and any of a vast number of other things. The USACE (U.S. Army Corps of Engineers) completed excavation of a a munitions pit on a residential property adjacent to, and owned by the American University. USACE is completing test trenching and arsenic contaminated soil removal at this and the adjoining property. All work at these two properties is expected to be complete in the fall of 2009. USACE is planning for destruction of recovered chemical and conventional munitions. The USACE has sampled approximately 1,500 for arsenic to date. Twenty seven additional properties were added to the site in 2006 based on a review of real estate records. Sampling of these properties and land owned by the District within the site is complete. EPA and the District Department of Environment are issuing comfort letters to property owners where sampling and any required remediation has been completed. USACE is attempting to gain access to all properties not previously sampled (approximately 10), and 5 properties where sampling revealed arsenic above 20ppm, the site cleanup goal. In September of 2005 ATSDR issued a Health Consultation for the Spring Valley Site. ATSDR recommended additional sampling of soil, groundwater and air in specific locations within the Spring Valley Site. The DC Council approved funding for a health study and a contract was awarded to Johns Hopkins for that study, and a report was released in 2007. The report concludes that the health of Spring Valley residents is good; better than National averages and consistent with a reference community with similar demographics. Additional DC funding may be allocated for follow-on work in FY’2010. In late 2003 perchlorate was discovered in groundwater at the site. A groundwater study is underway. Thirty nine monitoring wells have been installed near the Dalecarlia reservoir, adjacent to waste and munition disposal sites in the Spring Valley neighborhood and in other selected locations. Groundwater sampling data collected between 2005 and 2007 has identified two locations in the site where groundwater is contaminated with perchlorate, and one location where groundwater is contaminated with arsenic at elevated levels. The groundwater study continues in 2009 and 2010 with installation of additional monitoring wells including four deep wells and another round of well and surface water sampling. The Army maintains a Spring Valley internet site. Spring Valley is located in the Northwest section of the District of Columbia, including the American University. During WWI this area was known as the American University Experimental Station and Camp Leach, a 660-acre facility used as a research and test center for chemical weapons. The experimental station and chemical laboratories were located on American University property. In January, 1993 a contractor who was digging a utility trench unearthed World War I munitions in the Spring Valley area of the District of Columbia. During further investigations, munitions were discovered in pits located on the Korean Ambassador property, adjacent to American University and additional pits were also found on the adjacent residential property. The pit excavation and other work at the Korean property has been completed. An additional pit on the adjacent residence found numerous additional munitions and the work has not been completed yet. That work began in 2007 and was completed in 2009. Arsenic-contaminated soil has been removed from the Child Development Center play area on American University. Soil removal actions have been completed on several American University Lots and at approximately 90 residential properties. Approximately 50 residential properties still require soil removal. All soil removal at residential properties should be complete in 2009. Soil remediation at Federal and District owned property is scheduled for 2010. The site-wide soil cleanup standard for arsenic has been finalized at 20 ppm by EPA, the Army Corps of Engineers and the DC Health Department. The Mayor’s Science Advisory Panel has approved this standard. The arsenic contamination is the result of chemical warfare research carried out at the American University Experimental Station during WWI. The Army Corps of Engineers budget for this site is approximately $11 million dollars per year. Site work is expected to continue thru 2011. The USACE has completed excavation of lab waste and debris in an area near the boundary of the American University known as Lot 18. Numerous empty (scrap) munition and several intact bottles were removed from the site. One of the bottles was found to contain a small amount of Lewisite, a blister agent used at the site; a second bottle was found to contain mustard gas. Other chemical agent degradation products have been found in sealed containers. The USACE began excavation of additional lab debris in an adjacent area of the American University in 2008 and will complete the action in 2009. Contaminant descriptions and risk factors are available from the Agency for Toxic Substances and Disease Registry, an arm of the CDC. Hundreds of munitions and beakers with vintage chemical weapons, including “butter of arsenic” and lewisite, the “dew of death,” are being dug up in Washington DC — less than five miles from the White House (around American University). The chemicals date to WWI, during which chemical weapons resulted in a million casualties and about 26,000 deaths. This area, Spring Valley, is home to Diane Feinstein and AG Eric Holder. Lyndon Johnson, Richard Nixon and George HW Bush all lived there before entering the White House. Norton (D-D.C.) was given a status report by the corps, which has been directing the $170 million, 16-year cleanup of the munitions that are buried in scattered sites in the District’s Spring Valley neighborhood. This month, workers were surprised when they found a flask containing residue of the blistering agent mustard buried in the yard of a vacant house in the 4800 block of Glenbrook Road NW. Officials said they had thought cleanup at that site was almost finished. Spring Valley is an affluent neighborhood in northwest Washington, D.C., known for its large homes and tree-lined streets. Spring Valley’s residents include notable media personalities (e.g., Ann Compton, Jim Vance), lawyers (e.g., United States Attorney General Eric Holder, Brendan Sullivan), politicians, corporate officers, and elite Washington society (e.g., Washington Nationals principal owners Ed and Debra Cohen). Richard Nixon lived in Spring Valley before becoming President; his immediate predecessor, Lyndon B. Johnson, after becoming Vice President under John F. Kennedy, purchased a three-story mansion named Les Ormes (The Elms) in Spring Valley that had previously been the home of socialite and ambassador Perle Mesta. George H.W. Bush also lived in the neighborhood prior to his White House years. During World War I Spring Valley was an undeveloped area that the army used for testing chemical weapons. During excavations for new construction workers found unexploded ordnance, and scientists have found high levels of arsenic in the soil. The Army Corps of Engineers has undergone extensive testing and clean-up efforts in select parts of Spring Valley, a process that has been going on for years. Several embassy residences are located in the neighborhood, such as the ambassador’s houses of South Korea, Bahrain, Qatar, and Yemen. Spring Valley’s median home sale price in 2007 was US$2.725 and in 2008 $3.022 million. The Gowanus Canal, also known as the Gowanus Creek Canal, is a canal in the New York City borough of Brooklyn, geographically on the westernmost portion of Long Island. Connected to Gowanus Bay in Upper New York Bay, the canal borders the neighborhoods of Red Hook and South Brooklyn to the west and Park Slope to the east; likewise, Gowanus Bay borders the neighborhoods of Red Hook to the north and Sunset Park to its south. There are five east-west bridge crossings over the canal, located at Union Street, Carroll Street (a landmark), Third Street, Ninth Street, and Hamilton Avenue. The Gowanus Expressway (Interstate 278) and the IND Culver Line of the New York City Subway, the only above-ground section of the original Independent Subway System, pass overhead. With much fanfare the US Army Corps of Engineers completed their last dredging of the canal in 1955 and soon afterward abandoned its regular dredging schedule, deeming it to be no longer cost effective. Brooklyn’s fuel trade was already converting from coal and artificial gas to petroleum, which was served by the wider and deeper Newtown Creek, and natural gas, which arrived by pipeline. With the early 1960s growth of containerisation, New York’s loss of industrial waterfront jobs during this period was evident on the canal and, with the failure of the city sewage and pump station infrastructure along the canal, Gowanus was used as a derelict dumping place. Remaining barge traffic mostly carried fuel oil, sand, gravel and scrap metal. At this point, the issue of revitalizing of the Gowanus area was raised. In 1975 the City of New York established a Gowanus Industrial Renewal Plan for the area, which remains in effect until the year 2011. Since 1975, the surrounding community has been calling for the city, state, and federal governments to bring the full power of the Clean Water Act to bear on the environmental conditions left behind in this once thriving urban/industrial waterway. The opaqueness of the Gowanus water obstructs sunlight to one third of the six feet needed for aquatic plant growth. Rising gas bubbles betray the decomposition of sewage sludge that on a ripe, warm day produces the canal’s notable stench. The murky depths of the canal conceal the remnants of its industrial past: cement, oil, mercury, lead, PCBs, coal tar, and other contaminants. In 1951, with the opening of the elevated Gowanus Expressway over the waterway, easy access for trucks and cars catalyzed industry slightly, but with 150 thousand vehicles passing overhead each day the expressway also deposits tons of toxic emissions into the air and water beneath. In 2002, the United States Army Corps of Engineers entered into a cost-sharing agreement with the DEP to collaborate on a $5 million Ecosystem Restoration Feasibility Study of the Gowanus Canal area to be completed in 2005, studying possible alternatives for ecosystem restoration such as dredging, and wetland and habitat restoration. Discussions turned to breaking down the hard edges of the canal in order to restore some of the natural processes to improve the overall environment of the Gowanus wetlands area. The DEP also initiated the Gowanus Canal Use and Standards Attainment project, to meet the City’s obligations under the Clean Water Act. As of the summer 2009, the joint NYC/Army Corps Feasibility study has not been completed. In February 2009, the city of New York granted a zoning change to the developer, Toll Brothers Inc., allowing for a 480-unit, twelve-story, super-block residential project, the first permitted along the waterway. A comprehensive survey of the drinking water for more than 28 million Americans has detected the widespread but low-level presence of pharmaceuticals and hormonally active chemicals. Daughton says the contamination surveys help people realise how they are intimately and inseparably connected with their environment. “The occurrence of pharmaceuticals in the environment also serves to make us acutely aware of the chemical sea that surrounds us,” he says. About the above chemicals and pharmaceuticals found in water and the idea that it really makes no difference – the words to apply are “cumulative effects.” No one is drinking just one drop of water like that which they analyzed. The amount of water consumed in a day isn’t even accurate because of how many things were cooked in water, grown with water from public water sources, how many water sources permeated the skin each day, how many days, months and years these things were continuously consumed or a part of everyday living and the manner in which these chemicals and pharmaceuticals interact with the existing body chemistry and cell metabolism. It isn’t just a problem for those with compromised health, babies and children – it is affecting everyone negatively. And, since that isn’t the only thing in the ground water being used to water our fields, nor is it the only toxic chemistry in our drinking water and the water sources where our drinking water is derived – the chemical questions it raises are phenomenal. And, they are phenomenal in very bad health consequences for nearly all of our population, all of our children, all of our wildlife, and all of our future generations in the United States. This might need to get fixed right now instead of waiting another thirty years to do it. Drinking water system on test in U.S.
A new health study found drinking water in 31 out of 35 U.S. cities contaminated by a dangerous form of chromium known as hexavalent chromium. The recent studies by environmental and public health groups shed new light on the extent of drinking water contamination in America and the potential sources of that contamination. The Environmental Working Group (EWG) commissioned water sampling and testing for hexavalent chromium, also known as chromium-6. The results, published in the report Chromium-6 in U.S. Tap Water, found that more than 26 million people are serviced by the water utilities in the 31 cities where chromium-6 was detected. However, the report represents a one-time “snapshot” of the water quality in 35 cities, and without regular monitoring, the full threat to public health is unknown. Chromium is found in many forms, and the two most prevalent forms are trivalent chromium (chromium-3) and chromium-6. In small amounts, chromium-3 is a vital nutrient needed for healthy human metabolism, but chromium-6 is a known carcinogen and dangerous even in small amounts. Chromium-6 was the toxin contaminating the drinking water of Hinkley, CA, the case made famous by the 2000 film Erin Brockovich. California is currently the only state that requires water utilities to test for hexavalent chromium. The report, EPA’s Blind Spot: Hexavalent Chromium in Coal Ash, draws on U.S. Environmental Protection Agency (EPA) reports and other studies to identify 28 coal ash dump sites in 17 states that have contaminated groundwater with chromium at levels far above the public health goal proposed by the state of California. According to the report’s authors, the contaminated coal ash dump sites “are likely the tip of the iceberg,” and EPA regulators are operating with a “blind spot” that misses this significant source of water contamination. The report also uncovered a study by an electric utility industry group, Electric Power Research Institute (EPRI), that found that 97 to 100 percent of the chromium leaching from coal ash impoundments is the deadly chromium-6. This industry study tested water at 29 coal ash landfills and ponds, finding chromium-6 at 15 coal ash dump sites at levels hundreds of times greater than the proposed California goal. However, the locations of these dumps are unknown, identified only by a number. In stark contrast to the President’s support for EPA’s essential work to protect our children and families, the recently passed House Continuing Resolution would cut EPA’s overall budget — and the critical public health protections EPA provides — by 30 percent this year. This represents the largest cut to any Federal agency. It would cut an astounding $2 billion from EPA’s water infrastructure and water quality protection programs. These cuts mean that our drinking water has a far greater chance of contamination. These cuts also mean thousands of jobs lost – jobs that relate to clean water infrastructure. The CR would cut funds to clean up and redevelop brownfields by 30 percent from 2010 enacted levels – threatening the 5,000 jobs that EPA estimates this program supports. The House budget would slash 45 percent from the 2010 enacted level for federal aid to state, local and tribal governments to protect our communities from dangerous pollution. It also includes backdoor efforts to undermine EPA authorities that protect the air we breathe and the water we drink. These attempts to undercut landmark public health protections comes as EPA just released a new report showing that the Clean Air Act provides $30 in benefits for every $1 invested. This report also shows that the Clean Air Act prevented 160,000 cases of premature mortality, 130,000 heart attacks, 13 million lost work days and 1.7 million asthma attacks in the year 2010 alone. We are facing tough economic times, but tough times call for intelligent decision-making and wisdom, not reckless cuts that will do more harm than good – cuts that will lead to illness and premature death. We must protect the health of our children, while also building clean technology industries that can fuel the nation’s economy in the coming decades. We have seen that protecting the health of our families and economic growth go hand in hand. Since the year Congress enacted the Clean Air Act, US GDP has risen by 207 percent. The United States is also the world’s largest producer and consumer of environmental technology goods and services. This industry has approximately 119,000 firms. It supports almost 1.7 million jobs and generates $300 billion in revenues — including $43.8 billion in exports. Why take an axe to these industries? The characteristic greenish-gray to brown color of ordinary Portland cement derives from a number of transitional elements in its chemical composition. These are, in descending order of coloring effect, chromium, manganese, iron, copper, vanadium, nickel and titanium. The amount of these in white cement is minimized as far as possible. Cr2O3 is kept below 0.003%, Mn2O3 is kept below 0.03%, and Fe2O3 is kept below 0.35% in the clinker. The other elements are usually not a significant problem. Portland cement is usually made from cheap, quarried raw materials, and these usually contain substantial amounts of Cr, Mn and Fe. In Scandinavia, France and the UK, the level of chromium(VI), which is considered to be toxic and a major skin irritant, may not exceed 2 ppm (parts per million). “The Arizona Department of Environmental Quality was informed this week that the Arizona Portland Cement Co. failed a second round of testing for emissions of hazardous air pollutants at the company’s Rillito plant near Tucson. The latest round of testing, performed in January 2003 by the company, is designed to ensure that the facility complies with federal standards governing the emissions of dioxins and furans, which are byproducts of the manufacturing process.”  Cement Reviews’ “Environmental News” web page details case after case of environmental problems with cement manufacturing. CEMEX (BMV: CEMEX / NYSE: CX) is the world’s largest building materials supplier and third largest cement producer. Founded in Mexico in 1906, the company is based in Monterrey, Mexico. CEMEX has operations extending around the world, with production facilities in 50 countries in North America, the Caribbean, South America, Europe, Asia, and Africa. As of late 2003, CEMEX had annual cement production capability of 82 million tons and over 25,000 employees. Lorenzo Zambrano is the current chairman and chief executive officer. About one-third of the company’s sales come from its Mexico operations, a quarter from its plants in the U.S., 15% from Spain, and smaller percentages from its plants around the world. CEMEX has been accused of violating environmental laws in the United States. Environmental watchdog groups and the United States Environmental Protection Agency are threatening to file suit claiming the company has committed numerous violations of the Clean Air Act in Lyons, Colorado. The United States Environmental Protection Agency has also filed suit against CEMEX in Victorville, California, claiming the company failed to install modern air pollution controls, despite spending millions in renovations. In the United Kingdom, CEMEX was originally fined £400,000 on October 2006 after hazardous dust was deposited up to three miles (5 km) away from its Rugby works. The fine was the highest ever given under the Integrated Pollution Prevention and Control regulations, and was also the highest for an Environment Agency prosecution for six years.. The fine was however judged excessive by the Court of Appeal and so reduced to £50,000..
During tests conducted from June 10 to August 5, 2008, the Monterey Bay (California) Unified Air Pollution Control District reported high levels of Chromium VI, also known as Hexavalent Chromium, a cancer causing chemical agent, at an elementary school and fire department in Davenport, California. Chromium VI is the contaminant that inspired the movie, “Erin Brockovich“. The toxic substance apparently originated from dust emitted by the Cemex Cement plant in Davenport, as the levels of Chromium VI measured eight times the air district’s acceptable level at Pacific Elementary School and 10 times at the Davenport Fire Department. Both are located less than a half-mile from CEMEX. Chromium VI may have been unwittingly produced at the CEMEX plant in Davenport for the last seven years. According to Ed Kendig, the executive director of the Monterey Bay Unified Air Pollution Control District, it’s “highly possible” that Chromium VI continues to be produced across the country as an accidental, previously unknown byproduct of the cement-making process. In April 2007, CEMEX announced that it had installed a £6.5 million dust abatement system at the same works in Rugby, which had cut particulate emissions by 80%. The site comes under the auspices of the EU Waste Incineration Directive as it burns waste tyres for fuel. There are concerns over the impact on both the environment and human health from this practice, although it is common practice in many cement works.. Fly ash is one of the residues generated in combustion, and comprises the fine particles that rise with the flue gases. Ash which does not rise is termed bottom ash. In an industrial context, fly ash usually refers to ash produced during combustion of coal. Fly ash is generally captured by electrostatic precipitators or other particle filtration equipments before the flue gases reach the chimneys of coal-fired power plants, and together with bottom ash removed from the bottom of the furnace is in this case jointly known as coal ash. Depending upon the source and makeup of the coal being burned, the components of fly ash vary considerably, but all fly ash includes substantial amounts of silicon dioxide (SiO2) (both amorphous and crystalline) and calcium oxide (CaO), both being endemic ingredients in many coal-bearing rock strata. Toxic constituents depend upon the specific coal bed makeup, but may include one or more of the following elements or substances in quantities from trace amounts to several percent: arsenic, beryllium, boron, cadmium, chromium, chromium VI, cobalt, lead, manganese, mercury, molybdenum, selenium, strontium, thallium, and vanadium, along with dioxins and PAH compounds. In the past, fly ash was generally released into the atmosphere, but pollution control equipment mandated in recent decades now require that it be captured prior to release. In the US, fly ash is generally stored at coal power plants or placed in landfills. About 43 percent is recycled, often used to supplement Portland cement in concrete production. Some have expressed health concerns about this. Perchlorate is a regulated drinking water contaminant in California, with a maximum contaminant level (MCL) of 6 micrograms per liter (µg/L). The MCL became effective October 2007. For information provided to public water systems by the CDPH Drinking Water Program about the implementation of the MCL and the scheduling of monitoring, see links at the bottom of this page. Perchlorate and its salts are used in solid propellant for rockets, missiles, and fireworks, and elsewhere (e.g., production of matches, flares, pyrotechnics, ordnance, and explosives). Their use can lead to releases of perchlorate into the environment. Perchlorate’s interference with iodide uptake by the thyroid gland can decrease production of thyroid hormones, which are needed for prenatal and postnatal growth and development, as well as for normal metabolism and mental function in the adult. Its effects on the thyroid gland are the basis of the 6-µg/L public health goal (PHG) established in 2004 by Cal/EPA’s Office of Environmental Health Hazard Assessment. (PHGs contribute to the development of MCLs, as described here.) In January 2011, OEHHA released a draft technical support document for a 1-µg/L PHG for perchlorate. Monitoring, first in 1997 by the Drinking Water Program and then by public water systems, showed perchlorate to be a widespread drinking water contaminant, occurring in several hundred wells, mostly in southern California (see early findings). Perchlorate was also found in the Colorado River, an important source of water for drinking and irrigation, where its presence resulted from contamination from ammonium perchlorate manufacturing facilities in Nevada. EPA has decided to regulate perchlorate under the Safe Drinking Water Act (SDWA). The science that has lead to this decision has been peer reviewed by independent scientists and public health experts including the National Academy of Sciences. This decision reverses a 2008 preliminary determination, and considers input from almost 39,000 public commenters on multiple public notices (May 2007, October 2008, and August 2009) related to perchlorate. This action notifies interested parties of EPA’s decision to regulate perchlorate, but does not in itself impose any requirements on public water systems (PWSs). However, this action initiates a process to develop and establish a national primary drinking water regulation (NPDWR). Once the NPDWR is finalized, certain PWSs will be required to take action to comply with the regulation in accordance with the schedule specified in the regulation. EPA is replacing the existing preliminary remediation goal of 24.5 ppb with the interim health advisory value of 15 ppb. This goal will be used as a consideration when establishing cleanup levels for perchlorate at Superfund sites. 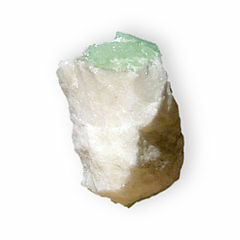 Thaumasite is a silicate mineral with chemical formula Ca3Si(OH)6(CO3)(SO4)·12H2O. It occurs as colorless to white prismatic hexagonal crystals, typically as acicular radiating groups. It also occurs as fibrous masses. Its Mohs hardness is 3.5 and it has a specific gravity of 1.88 to 1.90. Optically it is uniaxial negative with indices of refraction of nω = 1.507 and nε = 1.468. It occurs as a hydrothermal alteration mineral in sulfide ore deposits and geothermal alteration of basalt and tuff. 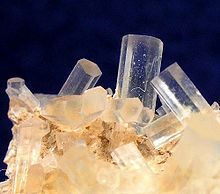 It occurs with zeolites, apophyllite, analcime, calcite, gypsum and pyrite. Thaumasite can also be formed along with other calcium-silicate hydrates (CSH) during cement alteration, especially when sulfate attack develops. It was first described in 1878 in Sweden and named from the Greek, “thaumazein”, to be surprised, in reference to its unusual composition with carbonate, sulfate and hydroxysilicate anions. Another quite surprising feature of thaumasite is the presence of non-tetrahedral silicon in its crystal lattice. Indeed, an atypic octahedral configuration is observed for Si present in thaumasite in the form of hexahydroxysilicate: [Si(OH)6]2−, a species exhibiting a geometry similar to that of the hexafluorosilicate [SiF6]2−. Gasland : True or False? About 20 percent of sludge is disposed of by land application to improve soil conditions or to fertilize the soil. The sludge is plowed directly into the soil to limit water runoff and for sanitary reasons. Recently proposed rules may prohibit this practice on agriculture land. Deep-well injection involves the pumping of sludge into a stable geologic formation. Deep-well injection is not commonly used and is specifically prohibited in the states of Wisconsin and Illinois. Because of its potential adverse impact on groundwater aquifers, EPA uses its authority under the Safe Drinking Water Act to control and also discourage this practice. Approximately 30 percent of generated sludge is disposed of in landfills. Contaminated materials are typically covered and compacted on a daily basis. Features such as clay layers are emplaced above and below the buried waste to prevent radon emissions and radionuclides from leaching into the groundwater. Approximately 42 percent of sludge is disposed of in lagoons. Any radium present in the sludge will settle in bottom sediments which may have to be periodically dredged and properly disposed of. Ion-exchange resins are used on smaller water supply systems to soften water by replacing Ca2+ and Mg2+ ions with Na+ ions. In the process, about 95 percent of the radium is also removed . However, the resins are usually back washed for reuse rather than being disposed. The backwash water, which contains radium, is typically discharged to storm sewers, underground injection wells or septic tanks, or is back washed to another ion-exchange column for the selective removal of radium. Radionuclide content eventually builds up in the resin after prolonged usage. A well-known example would be bisphenol A, a chemical widely used in plastic goods for decades, Hunt said. The chemical can leach from products into food and drink, and federal health officials say it is found in the urine of more than 90 percent of Americans. The government has long said that BPA is safe, based on studies that show levels of BPA used in commercial products are not toxic – meaning they would not kill – humans. In the 1960’s and 1970’s efforts were made to start fixing these things and for over 42 years they have not been fixed. Only a very small percentage of the persistent pollution has been tackled. In fact, with the amount of money that industries and businesses have spent on attorneys, public relations firms, lobbyists, lobbyists on top of lobbyists, US Chamber of Commerce and other business lobbyists, PACs, special interest groups to persuade the public through the media, fighting regulations in every single state and across the world, and fighting legislation and regulations in the Federal government, fighting the EPA, putting off making changes, changing their operations to other countries in some cases where they could continue polluting – and buying Republican Party candidates to serve their interests – they could’ve just put the damn filters on the smokestacks and rendered the wastewater into a neutralized safe contaminant free resource and made the same profits or even greater at the same time. Oh yeah – and the amount of money they’ve spent on decrying scientific studies, hindering them, legislating against them, legislating against their findings, lobbying and applying political pressure against those findings, undermining the credibility of those findings, etc., ad nauseum – they could’ve afforded to have designed systems that would never have polluted in the first place. That is some ridiculous sums of money that have spent over the last forty years and certainly been spent across multiple industries, through a multitude of corporations and industry / trade associations, through business associations, and think tanks and public relations consultants, and political donations and on and on and on – they could’ve just solved the damn problems for less than a quarter of one tenth of one percent of what they’ve spent fighting against doing anything about it. The families of these business leaders have been just as subjected to these pollutants as the rest of us whether they know it or not. And, some of those decision-makers who refused to be told what to do with their business and refused to stop doing their business in ways that polluted everybody and everything – are dead now as a direct result of the pollutants they unleashed on America. Why don’t they know that? Do they really think that it can’t get them if they are rich enough to go skiing in the Alps and go vacation in the beautiful coasts of the world and live in their elegant protected homes? What planet is their food coming from? What air do they think they are breathing? Oh wait, the Republicans up there in Washington that are gutting the budgets to the EPA and serving the business interests that paid for their campaigns don’t believe that mankind has had any negative effects on nature. And, they don’t believe that water with radioactive contaminants in it which were dumped upstream nearly on top of where the drinking water is taken could even remotely have anything to do with them or their families. Yeah – right. And if they don’t believe it will hurt anything then it won’t. That’s what they’ve been doing for the entire course of my adult lifetime and now I can honestly say, that my childhood was subjected to it, my children’s lifetimes have been subjected to it and my grandchildren’s lives have been subjected to it. My cousins, grandparents and parents have been subjected to it and every single person that I have ever known. Some have died horribly from cancers although they never smoked a day in their lives. It wasn’t smoking that killed them nor caused the cancers they’ve endured. But, there is a very good chance that the horrendous chemicals consistently poured into the environment in every single state, every rural area, every suburb, every city and every water source for every moment of every day over the last fifty years and more – could very well have caused those cancers, nightmarish suffering and deaths prematurely.